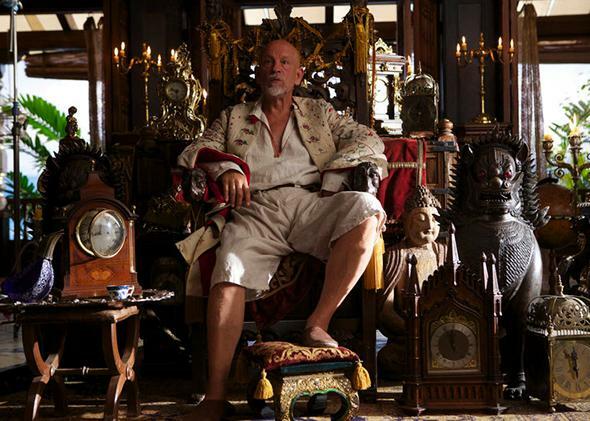 John Malkovich pirate drama Crossbones, reviewed. Yup, John Malkovich stars in an NBC pirate drama. All this scenery must be chewed. Presumably, John Malkovich could headline a series on HBO. So when you see him in NBC’s Crossbones, which premieres Friday night, strutting around wearing tropical-weight drop-crotch pantaloons in an allegedly 19th-century cabana that looks like a Club Med—except for the flayed corpse where the coffee table should be—know that he must have really, really wanted to play a pirate. And not just any pirate, but the legendary Blackbeard, who in this retelling is vicious and mercurial—and also with a trim (white) beard and dedicated to creating an island republic. Avast! Cower in ye boots, or grab a beach towel and enjoy a skinny-dip in a free society. It’s 1729 in the West Indies, and a British citizen has recently invented the chronometer, a (real) device that can calculate longitude at sea, therefore helping the powerful British Navy resolve its pesky pirate problem. The Navy tasks Thomas Lowe (Richard Coyle), a cheeky surgeon with exceptional sword and spy skills, to sail on the HMS Petrel, carrying the chronometer to England. But Lowe’s mission is not really to see the device safely across the Atlantic. The Navy suspects Blackbeard will try to seize it for himself. When he does Lowe will be able to take on his real operation: killing Blackbeard. All of this goes exactly as the Brits predict, and after a large cannon fight between nearly indistinguishable boats, Lowe arrives on Santa Compana, Blackbeard’s paradise island. (An aside: Is there anything more formulaic than a TV fight scene? Three minutes of quick cuts and huge, cartoonish punches about as plausible as a WWE match.) Blackbeard, who prefers to go by the title Commodore, greets Lowe in classic-creepy Malkovich style, his understated coo simultaneously sweet and rancid. “Allow me to introduce myself,” he murmurs—and then slashes a man’s throat so the blood spurts out in gouts. Lowe, thinking quickly, tosses some gunpowder on the man’s neck and lights it: instant cauterization. Commodore, meet period MacGyver. At certain moments, when Coyle and Malkovich banter about god, the devil, and England, Crossbones is almost the kicky fun it was meant to be. When Blackbeard eloquently declares himself “a fellow with no wish to be governed, inspected, indoctrinated, preached at, taxed, stamped, measured, judged, condemned, cast out, hung, shot,” his sibilant esses are as satisfying as the more standard pirate’s arrrs. But a few sentences later, Blackbeard returns to growling clichés: “I should be obliged to visit death upon you,” he says, and then threateningly holds up a very pointy ring—scary!—near Lowe’s eye. Everything about the show is similarly inconsistent, suggesting a series that spent most of its budget on its leading man and Caribbean locations and had little left for casting, continuity, or story conferences. The narrative gets going because Blackbeard wants the chronometer, which he then … gives away because he doesn’t want the chronometer. Lowe gets shot and heals scarlessly from one week to the next. The supporting characters, while nicely diverse, have been rowed in from some other, cheesier TV show, maybe Xena: Warrior Princess (no disrespect to Xena). No scenes in the pilot take place in a brothel, an oversight redressed in the second episode: The whorehouse that serves an island of miscreant pirates is sunny and clean and full of sunny and clean whores. The only person in 1729 who doesn’t wash his face daily is Lowe’s body man, who is covered in soot even when he is in the ocean. Blackbeard is so accomplished, he stitches up his slashed-up pate, without a mirror, single-handed. It’s not believable for a second, but Malkovich looks like he’s having fun pretending.